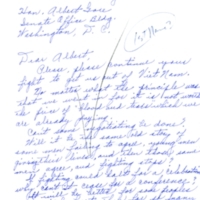 Form letter from Senator Albert Gore, Sr. sent in response to pro-Eldercare correspondence dated March 23, 1965. 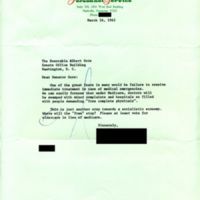 Form letter from Senator Albert Gore, Sr. sent in response to pro-Eldercare correspondence received by the senator. This particular version has a date already added. 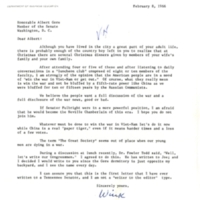 Edwin "Wink" Midgett, head of the Department of Business Education at Middle Tennessee State University calling for Gore to support increased efforts to win the conflict in Vietnam, dated February 8, 1966. 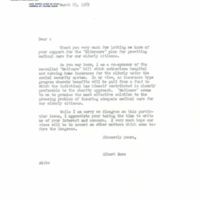 The letter is on MTSU letterhead. 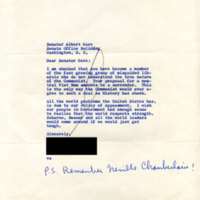 Correspondence from constituent to Senator Albert Gore, Sr., opposing a portion of the Social Security Amendments of 1965 that required food servers to report tips, dated May 11, 1965. 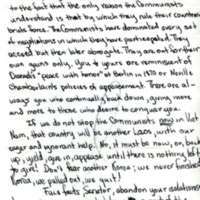 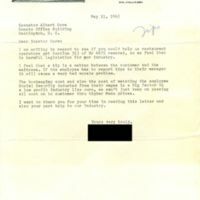 Correspondence from constituent to Senator Albert Gore, Sr., opposing a portion of the Social Security Amendments of 1965 that required food servers to report tips, circa May 10, 1965. 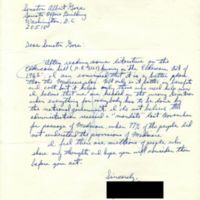 Correspondence from constituent to Senator Albert Gore, Sr. stating support for Eldercare legislation, dated March 20, 1965. 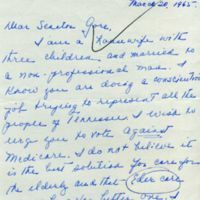 Correspondence from constituent to Senator Albert Gore, Sr. stating support for Eldercare legislation, dated March 16, 1965. 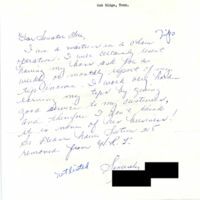 Correspondence from constituent to Senator Albert Gore, Sr. stating support for Eldercare legislation, dated March 15, 1965.